How much salt do most people consume per day? Studies show that an average person eats 9–12 grams per day, nearly double the recommended maximum of 5-6 grams. Food manufacturers in countries from the West to the East are challenged by the World Health Organization’s (WHO) sodium reduction recommendations of 30% by the year 2025. Governmental food standards agencies worldwide are stepping up the pressure, setting increasingly aggressive interim salt reduction targets. Where does the sodium problem lie? Is developing low-sodium ingredients and products that hard? In recent years, manufacturers throughout the food industry have attempted to offer reduced-sodium alternatives. Their success has been marginal because their solutions have primarily centered on direct salt reduction and introducing various salt substitutes and traditional flavor enhancers, such as monosodium glutamate (MSG), nucleotides and yeast extracts. Mainstream consumers hungering for flavor have made their displeasure with these solutions clear at the checkout lines and in restaurants. With the food industry still far from its salt reduction goal and a lack of good alternatives in sight, some may conclude that large-scale changes in diet are what the public needs. Unfortunately, this degree of change could dramatically impact manufacturers. The good news is that there is a moderate solution, an ideal solution, in fact. 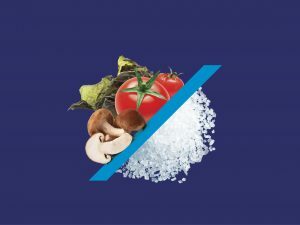 Salt of the Earth, a one-hundred-year veteran in the food industry, offers a natural ingredient that makes the transition to truly tasty, reduced sodium products simple. The Mediterranean Umami product line from Salt of the Earth offers a two-for-one solution for food production formulations and food service recipes. Developed to reduce sodium while boosting flavor, this all-natural ingredient is prepared from a proprietary blend of sea salt and umami-rich vegetable sources, such as tomato concentrate, and seaweed and mushroom extracts. Most professional chefs are familiar with umami, having learned about it as a flavor profile in culinary school. A chef’s key goal is to prepare dishes that produce the umami sensation, a pleasant meaty-type taste with a mouthwatering feeling over the tongue. These days, about 30% of consumers worldwide actively look for products with a clean label, according to a study conducted by MMR Research Worldwide. Mediterranean Umami is non-GMO and natural; it contains no MSG, artificial colors, E numbers or preservatives. The Mediterranean Umami product line helps companies introduce a wide range of health-focused, clean label products. “Mediterranean Umami can be applied to a wide array of prepared food applications, from baked goods to cereals and meat products to sauces,” highlights Tal on the product line’s successful penetration into the sodium reduction segment. He discusses several examples of successful product formulations using Mediterranean Umami. A leading processed meat manufacturer in Israel conducted a recipe trial, which showed that Mediterranean Umami reduced salt in sausages while introducing flavor improvements. Sodium reduction was up to 30%. In a series of salty pastry tests conducted by Salt of the Earth, Mediterranean Umami recipe results were impressive. By lowering salt and adding Mediterranean Umami, a savory cheese pastry filling achieved sodium reduction of more than 30%. Salt of the Earth eliminated MSG and reduced sodium in the mushroom-based filling of popular Turkish-style burekas by 35%. Flying under the radar of food developer taste detection, a cheddar cheese cracker tested had both salt and cheese reduced by 25% with the introduction of Mediterranean Umami into the recipe. This result shows that Mediterranean Umami also shows promise for cost reduction and profitability. Salt of the Earth teamed up with a fish producer to test canned tuna and discovered that Mediterranean Umami helped reduce sodium by 28% with no taste impact and no off flavors. MBA graduate students at the Northwestern Kellogg School of Management in Chicago recently conducted a study with Mediterranean Umami in collaboration with Salt of the Earth. The Chopping Block Culinary School in Chicago also participated in the study in which professional and avocational chefs introduced Mediterranean Umami into selected recipes. As Tal describes, “The research revealed interesting insights into the factors that influence chefs’ ingredient selections and what drives them to feature Mediterranean Umami in their culinary repertoire. 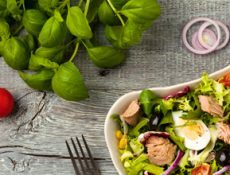 The results showed that sodium reduction and taste were key parameters in their decision to cook healthy food.” The chefs surveyed indicated that Mediterranean Umami had twin usage, both as a natural flavor booster and as a sodium reduction ingredient. Revital Ben-Shachar is the Global Marketing Director for Salt of the Earth.